Like a lot of customers, Bobby brought in a sketch of what he was thinking of for his board. He was open to how I rendered it out. With a combo of spray gun and brush strokes I just let the colors and motion of the design flow. It's not until the next day when the colors dry that I can assess how it's going to come out. This one worked out well. The crowd gets a few words from the champ. Having come in runner up in his division at last year's event, Sam went long to win at the 2009 Santa Cruz Longboard Union's Memorial Day contest. 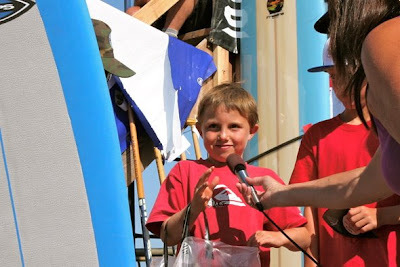 Being the youngest contestant in the contest at 8 years old, he showed some pluck and picked off a few really nice long waves in the final at Cowells. This 9'8" solid balsa gun has been sitting up in the racks in my shaping room collecting dust for quite a while. It was 75% shaped out but for one reason or another I was stuck on how I wanted to finish the shape out and what to do for the tail block. When the Sacred Craft show came around I was inspired to finally dust it off, finish the shape, and get it glassed up. I chose to do a simple mahogany tail block and to put a cord loop on it. A single fin box fits nicely in between the wedge stringer. The board has some very interesting wood with a lot of character. The gloss and polish just seems to makes the wood glow. 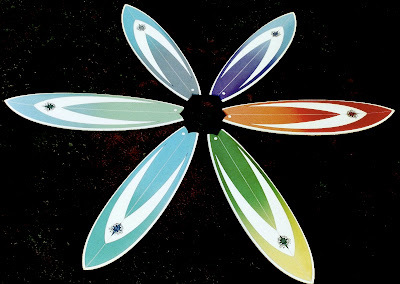 This board struck a cord and I was very pleased to show it at the Sacred Craft Surfboard Expo. For me this is what the whole thing is about: top quality custom built boards. 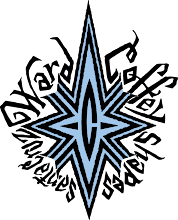 Congrats to the brave shapers who reproduced the Bradbury Designs. Most of them didn't even use templates. Very bold! And a very special shout out to Doug and Dave at Handcrafted and to JP and Peter at Moonlight Glassing for being such good torchbearers for the local Mom and Pop glass shops that do world class quality work and are the envy of all. How many boards, display racks, tools, and other curios can you fit in a Ford van? Well, today we found out. It was Logistics Day which meant putting the finishing touches on boards, packing up, and organizing transport to the Sacred Craft show in Ventura. Fletch says "What do you mean, we can fit 10 more boards up there. Who needs to see out the back?" My response, "How will I look back and check the surf?!" How many surfers do you know who would order a board and say "take your time" and "do whatever you want for an airbursh"? Ok, a few I'll admit, but here is where the field gets narrowed down. Chris not only did that, he also agreed to let me take his board down to the Sacred Craft show this weekend and let hundreds of other surfers ogle and fondle his custom board before he could even put wax on it. And to top things off, after getting a quick look at his board and handing it right back to me to pack up, he also handed me a couple hundred bucks! "I forgot to give you a deposit," he said. With summer size surf starting to bloom, this collection of colorful boards reminds me that it's time to start building more fishes. Known for being outstanding in it's field, the small wave fish is a perennial favorite in a lot of surfer's water garden. Brian's GTO inspired 5'9" single fin is all tricked out with pigment lam top and bottom, white pigment panels, pinlines, and a gloss and polish finish. With the good waves we've been having he's been getting some great runs at his local race track. All he needs now is to get one of those comp jackets that all the guys were wearing in the 60's. Gary had a pretty clear idea what he wanted for his next board. A board just under 7', 16" nose, 23" wide, 16" tail. We fiddled around with some templates so we could maximize the outline curve. By throwing in a set of wings we were able to decrease the tail width and create a nice pivot point around the fin cluster. Again, by going with the 5 box option this will be a very versatile board. So depending on his attitude and what the conditions dictate, Gary should be able to hatch a plan that will keep his stoke going. For Gary's insight on the board, check out Srfnff. Spring break meant we could pack up our bag of tricks and do a road trip down south to one of our favorite campgrounds. It's tucked in right next to a little point break. With everything from boogie boards to SUPs, we were ready for anything. This gem along the coast has been a family favorite for some time and always seems to pack some pint size surf for the boys to run amuck. Ben was amped to try out his new noserider (thanks, Dad, for staying up late the night before to get the board finished}. This board is 8'2" (that's still 3' over his head) x 21" x 2 1/2". It's fully old school: 50 / 50 rails and solid concave up front. Because of the small size it looks racy. ... he stepped up and charged on his short board.